One of the fastest growing counties in Texas, Burnet County is located in the heart of the Texas Hill Country, with almost 1,000 square miles of beautiful lakes and rolling hills. 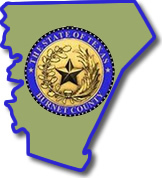 Burnet County was organized in 1852, and like many counties of its time, had agriculture as its primary economic base. Although agriculture continues to play an active role in the lives of Burnet County citizens, tourism has taken a front seat in driving the economy of the county. Thousands come to Burnet County each year, taking advantage of the excellent boating, fishing, and camping opportunities.